Perhaps hope lies deep underground. Specifically, hope of detecting dark matter: the stuff making up 80 percent of the total mass of the Universe. Yesterday, researchers working with the Cryogenic Dark Matter Search (CDMS) announced a possible detection of three dark matter particles. They’re right to be cautious: several marginal observations of dark matter particles have been announced over the years, only to be squashed by later examination. The recent Alpha Magnetic Spectrometer (AMS-02) results were heavily hyped, and while they might have dark matter hiding in them, the data are far too ambiguous to say anything either way yet. The new announcement is a different beast. Rather than looking for elevated positron levels from dark matter annihilation as AMS-02 does, CDMS is a set of solid geranium germanium [update: and silicon] crystals, cooled by liquid helium to 40 millikelvins—0.04° C above absolute zero. If a dark matter particle known as a WIMP (weakly interacting massive particle) hits a nucleus inside the crystal, it will set up a small vibration: a quantum sound wave known as a phonon. However, these three particle candidates seemed to correspond to the WIMP regime, and that lowers the probability of this being the jerky cosmos being jerky again. The technical term for the level of detection is “three sigma” (3σ), which means the detection is 99.7 percent likely to be real. While that might seem like it’s good enough to count as a positive detection, we must remember that there are a lot of background signals to confuse things. To put it another way: if we had 1000 background particles, we might get 3 fake signals by random chance. CDMS has a lot more than 1000 events to sift through. Nevertheless, I’m hopeful, not just because I visited CDMS last May as part of the research for my book-in-progress, Back Roads, Dark Skies. 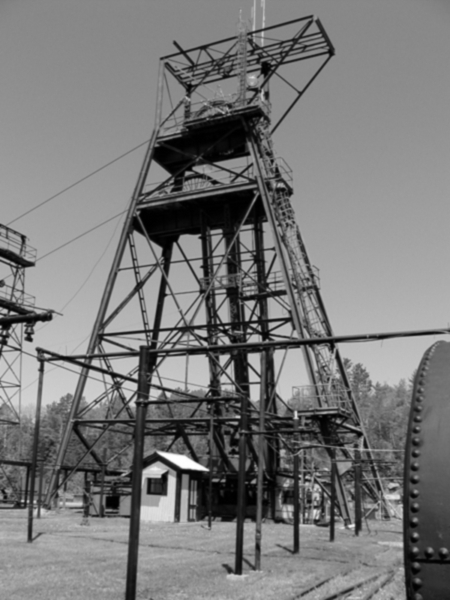 CDMS is currently located at the bottom of the old Soudan iron mine in northern Minnesota, a half-mile underground to help shield it from background radiation. The detector was actively operating, so I couldn’t get a close look at it. 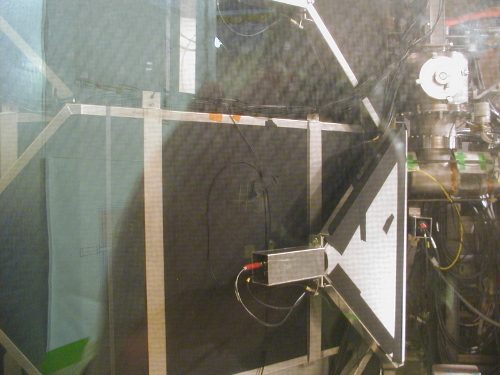 (Not only is it kept at really low temperatures, but the cold chamber is inside a clean room as well. I could barely get a fuzzy photo through two layers of glass.) CDMS is a clever experiment, tricky to operate and to sort the real signals from the false. There’s a good chance these three particle candidates are not real, especially since they contradict earlier results from the XENON experiment, but the combination of care and (let’s face it) coincidence with theoretical models means I’m willing to peek out from under the blanket of my pessimism. If these results are indeed real, then they correspond to a WIMP of mass around 8.6 billion electron-volts (8.6 GeV). For comparison, a proton’s mass is about 0.9 GeV, and the Higgs boson detected at the LHC is about 125 GeV. Even though it’s high mass compared to ordinary matter particles, it’s at the lower end of the WIMP mass regime. The pending upgrade of CDMS, known creatively as SuperCDMS, will use Interestingly, the WIMP signal was found in silicon crystals, which are more sensitive to lower mass WIMPs. As always, time and more data will tell. Optimism doesn’t always pay in particle physics, but these days, I’ll take what I can get. Was looking forward to your blogpost on the CDMS news – not disappointed! Could you please elaborate a bit on what is meant by ‘corresponding to WIMP regime’? Er, I could have phrased that better – my apologies. The result looks like a WIMP hitting a nucleus, and that nucleus recoiling, as opposed to something else causing the signal. The mass is also within the realms of possibility for WIMPs, according to what we know about the weak interaction, but that’s not a terribly stringent requirement. This result is actually from the CDMS Silicon detectors, not Ge. It’s actually relevant, because I don’t believe they’re aiming to use Si detectors in the SuperCDMS, but I could be misremembering. You’re right: I misread the comment on the CDMS page. If these signals are borne out, they might consider using silicon in later experiments, since that’s more sensitive to the lower-mass. I’ve corrected the post accordingly. How wonderful if at the end we find that the DARK-SECTOR is a whole veiled world of its own kind of existence…..
Scientifically speaking , might that be a possibility ….a real possibility ?